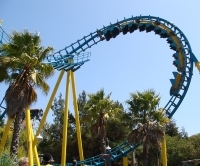 Located in Vallejo, Six Flags Discovery Kingdom is an animal theme park that offers wildlife experiences with a range of creatures. Visitors can feed dolphins, sea lions, seals or giraffes, or watch trained dolphins and elephants perform in shows. The park's animals include tigers, killer whales, camels, alligators, otters, flamingos, penguins, snapping turtles, sharks and more. Six Flags Discovery Kingdom also has dozens of rides ranging from the thrilling Medusa rollercoaster to the kid-friendly Seaport Carousel. Kids will enjoy meeting their favourite Looney Toons characters like Bugs Bunny and Daffy Duck, while thrill-seeking teenagers will enjoy the more intense rides. Admission: $65.99 adults, $45.99 children under 48 inches tall. Online discounts are available on the website.